A: Hi, I'm a Megan. B: ...and ask for Mac, he should recognize you. 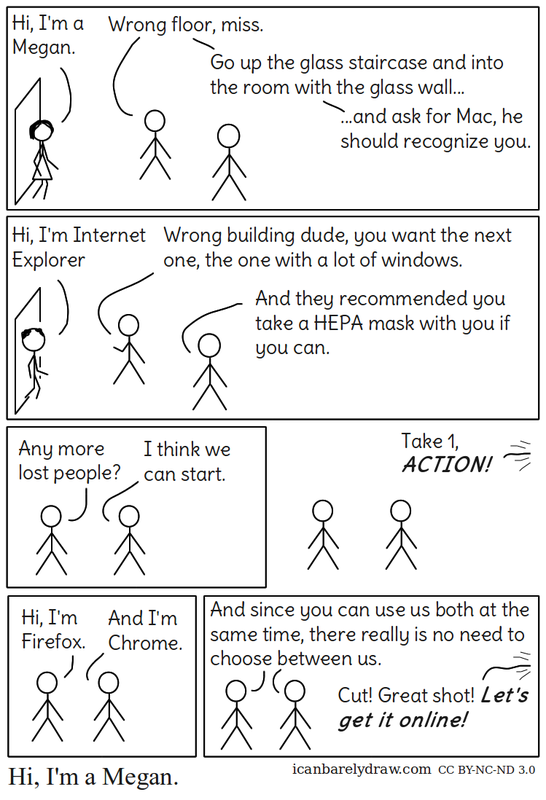 C: Hi, I'm Internet Explorer. B: Wrong building dude, you want the next one, the one with a lot of windows. C: And they recommended you take a HEPA mask with you if you can. B: Any more lost people? C: I think we can start. Offscreen voice: Take 1, ACTION! B and C together: And since you can use us both at the same time, there really is no need to choose between us. Offscreen voice: Cut! Great shot! Let's get it online! Title: Hi, I'm a Megan.